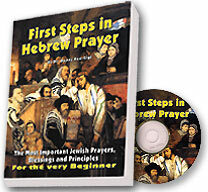 The beautiful accompanying book provides easy entry to your first steps of Jewish prayer. 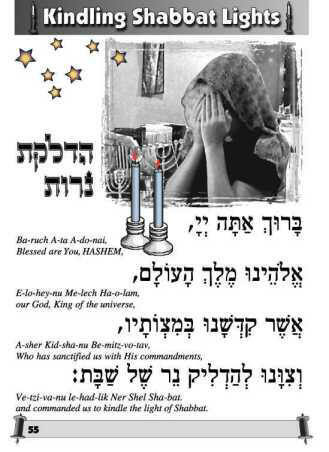 It introduces you to the most important prayers and blessings with the Hebrew text in bold letters, line-for-line with English translation and transliteration, and is illustrated with a beautiful selection of graphics and photos. Used in tandem with the accompanying Audio CD, you can easily find and study every prayer and blessing on your CD stereo or computer. be able to appreciate the meaning and significance of the Hebrew prayers. The text conforms to that of a traditional Siddur, but every page is titled and organized in such a way that you can find any prayer or blessing within seconds. There are 60 prayer tracks on the CD, recorded with the wonderful, rich voice of Rabbi Tzvi Cooperman. These tracks include narration plus traditional tunes of the various prayers. So not only will you learn the meaning of the prayers but you will learn "How To" Chant the prayers in the traditional tunes. Each Hebrew Prayer includes Original Hebrew plus Translation & Transliteration. Each prayer is taught and read in CD quality crystal clear human voice. 60 prayers taught in individual lessons. Learn "How To" Chant the traditional tunes. Includes a "training Siddur" which is formatted in the traditional Siddur format. E-Z Hebrew Phrases Conversational Hebrew Made Easy! Hebrew So Simple! Easy, Fun, Self-Study Audio & Video Course! Hebrew Bible Narrated The Whole Bible Narrated in Hebrew on 4 Audio CD's! My Siddur Quiz Ideal tool for understanding Siddur ( Hebrew Prayer Book)!